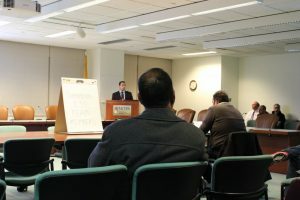 In his article “Combating Sewage Overflows,” Mike Montemarano reported on the meeting and the presentations that were given for Bayonne (which has 28 outfalls, or pipes from which combined sewage overflows into the Newark Bay, Kill Van Kull and New York Bay, North Bergen (one outfall), Jersey City (21 outfalls) and Guttenberg (one outfall). East Newark (one outfall) is a densely populated and heavily developed town, and is focusing on gray solutions including underground tanks, disinfection and an expansion of its sewer treatment plant. Kearny (five outfalls) is planning a partial sewer separation and underground storage. The town is also evaluating potential green infrastructure projects that were identified by Rutgers in its Green Infrastructure Feasibility Study for Kearny and sites identified by the Kearny AWAKE group. Paterson (23 outfalls) is looking at gray solutions including sewer modification, tunnels, offline-storage, disinfection, and sewer separation, and green infrastructure solutions that are estimated to reduce overflows by between 3 percent and 6 percent..
Newark (18 outfalls) and Harrison (seven outfalls) did not have time to present. The next meeting is planned for May. Full presentations for each of the towns are posted on the Clean Waterways, Healthy Neighborhoods site. The City of Newark is working with community partners to host a series of public meetings to gather community input on the evaluation of alternatives. Newark Stormwater Solutions is a dedicated website developed to gather community input on the evaluation of alternatives, and their community presentation is available for download in English, Spanish and Portuguese. The Jersey City Municipal Utilities Authority is also hosting public meetings. It has a web page devoted to the Long Term Control Plan, including a survey to gather community input on the proposed alternatives to combined sewer overflows. What are the options being considered to reduce overflows? Green infrastructure: Nature-based solutions, like rain gardens and permeable pavement, that capture stormwater where it falls, allowing it to absorb into the ground or be saved for later use before it enters the combined sewer system. These options reduce total storm flows or peak flows. Increased storage capacity in the collection system: Storing sewage and stormwater in the existing pipes or new storage structures (e.g., storage tunnels, underground or above-ground tanks) during a rainstorm allows it to be released to the sewage treatment plant slowly following the storm. Increased storage capacity can also come from cleaning existing combined sewers to reduce blockages and filled areas. Sewer treatment plant expansion and/or increased storage at the plant: Identifying opportunities to build more storage at the sewer treatment plant or build more capacity to process sewage and stormwater at the plant. Infiltration and inflow reduction: Fixing the combined sewers to reduce the amount of water that infiltrates into the pipes from cracks. Sewer separation: Adding a separate pipe system for stormwater that will discharge directly to a stream or river, which will reduce the volume in the sewage pipes that go to the treatment plant. End-of-pipe treatment of the CSO discharge: Adding sewage treatment, including disinfection, at the end of the outfall pipes. CSO-related bypass of the secondary treatment step at the sewer treatment plant: Creating more capacity at the sewer treatment plant by bypassing the secondary treatment of the mixture of sewage and stormwater. This approach results in partial treatment of the combined sewer flows during storms, rather than complete treatment of part of the flow and no treatment of the overflows.